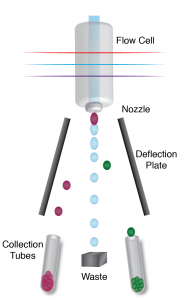 An extension of flow cytometry is cell sorting, aka FACS (Fluorescent Activated Cell Sorting). 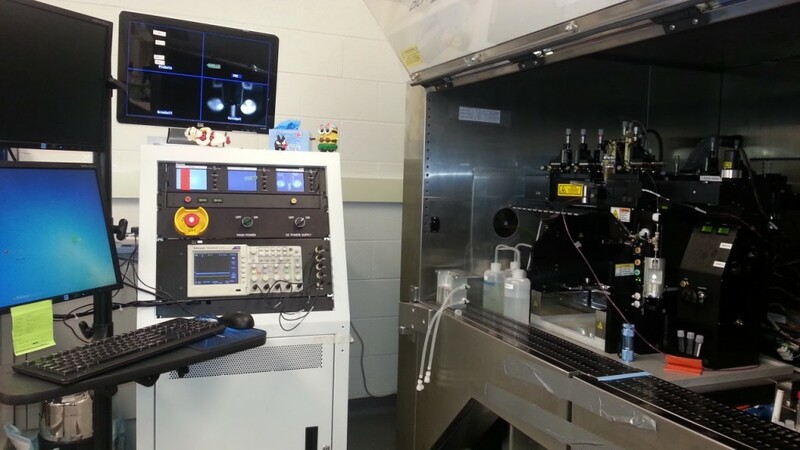 Like conventional flow cytometry, cells are labelled with antibodies and dyes that fluoresce when bound to cells, but the instruments are designed so that cells can be collected and used for downstream experimentation. When cells are sorted, the sample is injected into a stream of sheath fluid that passes through the flow cell and laser intercepts. Fluorophore excitation and emissions are collected at the flow cell and then the stream carries the cells through a vibrating nozzle. The vibrations break the stream into distinct droplets, to which a charge may be assigned if a cell of interest is present after leaving the nozzle. The charged droplets are then accelerated through a high voltage field and can be electrostatically diverted from the central stream and deposited into a test tube or microtitre plate. Almost any population that can be identified with standard flow cytometry can be sorted; typical sorting experiments can range from single colour clonal selections to highly complex multi-parameter experiments where up to 6 populations can be collected simultaneously. Sorting is fast and can reach speeds upwards of 1000s of events/sec while yielding highly purified populations clean enough for use in other applications like imaging, proteomics, genomics and adoptive transfers. Cell sorting at our facility is considered a BSL-2 activity and as an additional measure of safety, our technicians are the only persons authorized to operate the sorters since they have been trained to troubleshoot breakdowns and in procedures for handling aerosol containment during failure situations. Please contact us by email if you have any questions. Please visit the following pages for our instrument configurations and sort-set ups. Please do not turn the FFSS systems off. They are to remain powered on at all times.